The intensity of hybridization signals of the loci of microsatellites (here simple sequence repeats, SSR) was variable. It could consist in just a few spots of signals to aggregations of many spots that seem to fill the centromeric heterochromatin completely. In general it was observed that the weaker was the signal the more irregular was their detection. Therefore, only those microsatellites motives have been chosen that enabled the detection on a regular base. The loci of the microsatellites were detected using the Digoxigenin-Biotin amplification system with two or three layers of fluorochrome-labled Avidin-FITC. Figure: FISH signals (yellow-green, see arrow heads) of the three tetranucleotid motives of (AATG)4, (GATA)4 and (GACA)4 on polytene chromosomes of Phaseolus coccineus. Chromosomes are counterstained with DAPI and displayed here in grey or red. (a) An incomplete set of chromosomes with signals of (AATG)4 on all chromosomes in the cHC and the NORs. 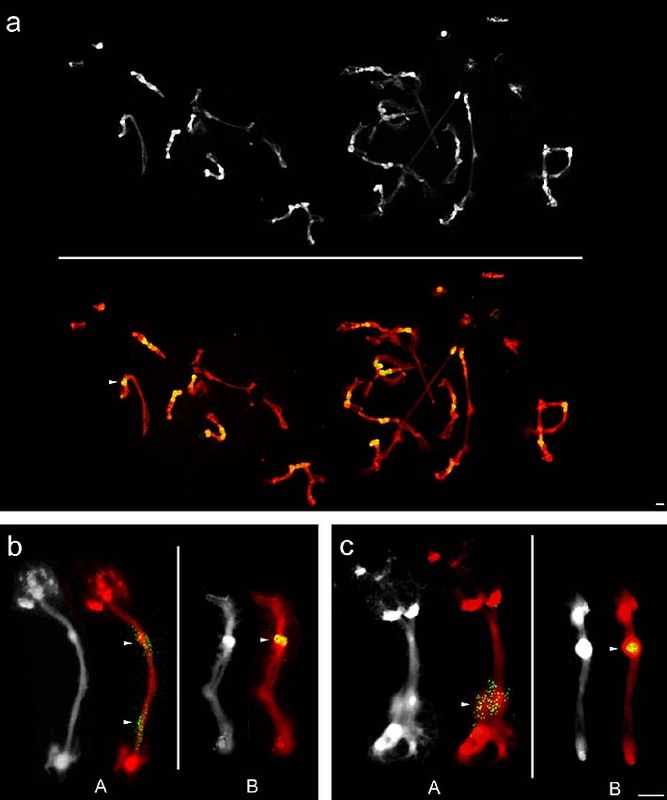 (b) Signals of (GATA)4 on chromosomes A and B. (c) Signals of the (GACA)4-probe on chromosome A and B. The scale bar represents 10 µm.